Johnny Q is an 11-year-old boy with a history of mild intermittent asthma, who develops a slight cough and begins to wheeze while in school. He is sent to the school nurse who notes slight wheezing on auscultation. Johnny also states that his throat hurts. The nurse measures his vital signs, pulse oximetry, and peak flow using a handheld recording device that records the data and transmits it to her desktop computer. 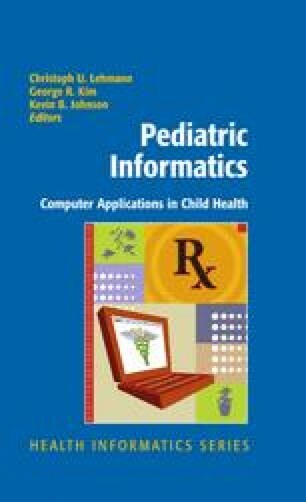 A computer application opens Johnny’s personal health record (PHR), which opens to a problem list with records of his treatments for asthma. The encounter is time-stamped and the handheld data is entered into the new record. A text message is sent to Johnny’s mother cell phone (as specified whenever Johnny’s PHR is opened). Lenhart A, Madden M, Macgill AR, Smith A. Teens and Social Media: the use of social media gains a greater foothold in teen life as they embrace the conversational nature of interactive online media. Pew Internet & American Life Project; 2007. Available at: http://www.pewin ternet.org/PPF/r/230/report_display.asp. Accessed December 21, 2008. Lenhert A. Cyberbullying and Online Teens. Pew Internet & American Life Project; 2007. Available at: http://www.pewinternet.org/PPF/r/216/report_display.asp. Accessed December 20, 2008. American Academy of Pediatrics. SafetyNet; 2008. Available at: http://safetynet.aap.org/. Accessed December 21, 2008. Wenger E. Communities of Practice: A Brief Introduction; 2008. Available at: http://www. ewenger.com/theory/index.htm. Accessed November 22, 2008.